A door doesn’t have to be just a door. Your entryway is the eye to your home, and it can be used to express your own unique personal style and can also be utilized as a functional work of art. We take pride in our ability to hear a customer’s vision for their entryway and utilize our resources and talents to bring that vision to reality. 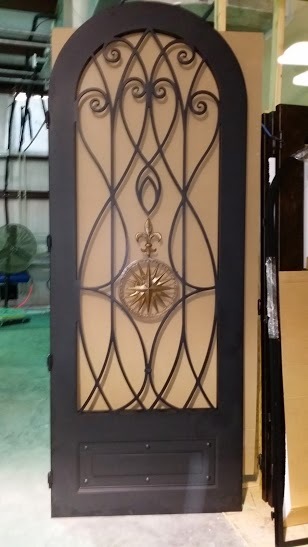 Recently, a customer came to us with a specific idea for her front door. 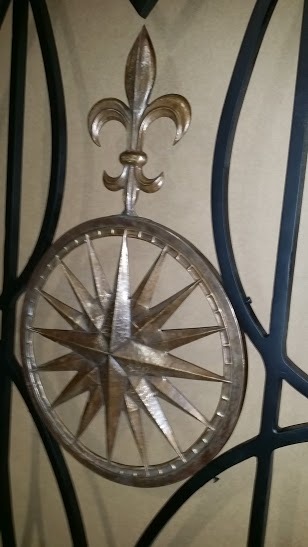 She was inspired by a bronze compass rose that she saw at the Sea Pines Resort, and had the idea to incorporate that compass into her front door design. Of course, we were thrilled with the opportunity to not only help her bring her vision to life, but also to work hand in hand with a talented artist. Even though our customer lives in Florida we knew our DP70, Florida rated, 48″ by 120″ wrought iron doors would withstand Florida’s intense and unpredictable weather. 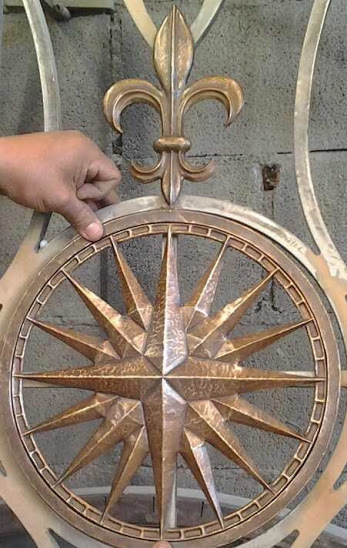 We adjusted the wrought iron scrolling design to compliment the compass and fleur de lis medallion, and our customer hired sculptor David Ponsler to recreate the compass rose out of bronze metal. David is an incredible artist, and you can click here to see a YouTube video of him at work. 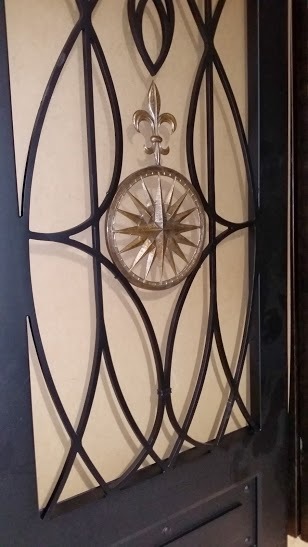 He handcrafted the medallion out of hammered bronze, and it came out perfect! 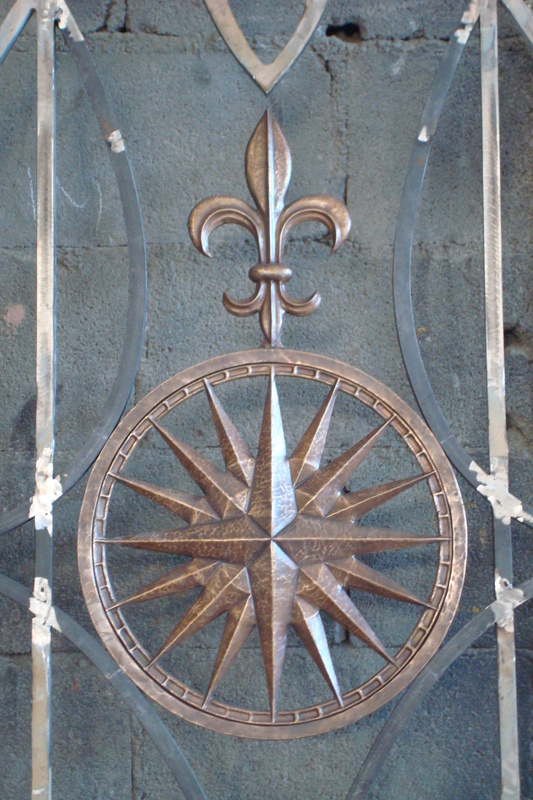 We hand forged the compass in place within the wrought iron scrolling on the door. 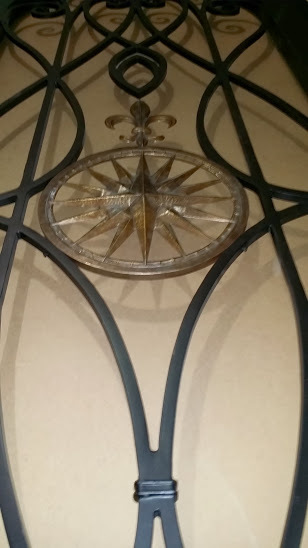 Once the compass was secure, it was time for the door to be painted and sealed. This is what the door looked like right before it was packaged up and shipped to the customer. The glass will be shipped separately and will be installed when the door is installed on the home. Watch our Facebook, Twitter, and Google+ feeds for a completed picture of this door installed on our customer’s custom home. We think the door came out fantastic! What do you think? Leave us a comment below and tell us what you would you incorporate into your design if you could create your own custom dream door!